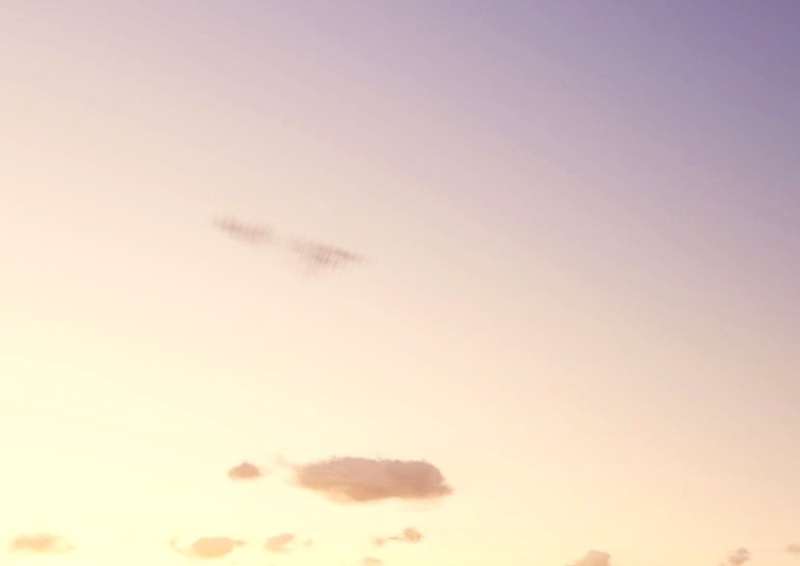 Happiness is a universal aspiration. One of the greatest pleasures known to man is devotional service to Lord Krishna. Born of purity in thought and enlightenment in spiritual understanding, bhakti is the acme of human consciousness. Bhakti is su sukham kartum, blissfully performed (Bhagavad-Gita 9.2). 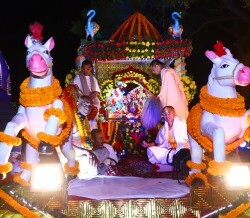 Festivals lend a special excitement to the practice of bhakti. A devotee under the expert guidance of a bonafide spiritual master comes to relish the form, name, and pastimes of the Lord. When he hears of the Lord’s beauty, His infinite potency, His empowering words and His enchanting pastimes, the spiritually mature devotee experiences sublime bliss. Bhakti is essence an eternal celebration of the Lord’s transcendental glories. The lunar month of Kartika, which usually falls between October and November in the western calendar, is a joyful period for Vaishnavas. In the pleasant autumn atmosphere, the Lord enacted some of His most captivating pastimes in Vrindavan. 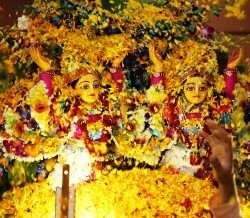 Devotees especially celebrate the Damodara pastime of the Lord throughout the month of Kartika. In Sanskrit, “dama” means rope and “udara” means belly. Damodara refers to Krishna who was bound with a rope by His mother Yashoda. The Damodara lila was performed five thousand years go when Lord Krishna was just a baby living with His foster parents Nanda Maharaja and mother Yashoda in Gokula. Once while nursing baby Krishna while she churned butter, mother Yashoda had to rush when a pot of milk kept on the fire in the kitchen was boiling over. When baby Krishna was abruptly dropped, He became angry and broke the mud pot in which His mother was churning butter. In anger and hunger He ran to the pantry, got on top of a big grinding mortar, broke pots of butter ate some and then began feeding the ubiquitous monkeys that had gathered there. Wary of His mother’s certain anger at His naughtiness, little Krishna nervously glanced hither and tither. He was looking all around with great anxiety, fearing His mother would chastise him. Mother Yashoda, on the seeing the mess resolved to punish the boy for His own good. She picked up a stick and went searching for Krishna. Upon seeing Him up on the mortar, she crept up behind Him. But Krishna saw His mother approach and fled as though in great fear. As Yashoda chased the boy, her hair scattered and the flowers she was wearing showered to the ground. Finally, perspiring, she caught up with the boy. Little Krishna sobbing fearfully admitted to His guilt. His condition is described in the Śrī Dāmodarāṣṭaka found in the Padma Purana. In the Srimad-Bhagavatam, Queen Kunti expresses to the Lord her wonder at His fear of mother Yashoda. Lord Krishna had effortlessly slain the formidable demons Putana, Shakatasura and Trinavarta and yet before Yashoda He stood fearfully. This indeed is perplexing. Seeing her son so fearful, Mother Yashoda threw away the stick. She still wanted to teach Him a lesson so she decided to tie Him to the same wooden grinding mortar He had climbed to break the butter pots. Inwardly she did not want her son to run away from home in His fear. Taking a length of rope she wound it around His belly to bind Him it to the mortar. She however, was unable to tie the knot for the rope was just short by a width of two fingers. She added some more rope, and was still she could not tie the knot. She added more and more rope until all the rope in the house was used up and still when it came to tying the ends, the rope ended up two fingers short. This was Krishna’s exhibition of His unlimited potency to Yashoda. He could be bound only of He agreed to. Seeing His mother exhausted from her labours, Lord Krishna finally relented and let her tie Him. Krishna can only be bound by transcendental love and nothing else. In the Bhagavatam, while describing this pastime the great sage Shukadeva Goswami proclaims that not even Lord Brahma, Lord Shiva nor even mother Lakshmi could receive such a mercy from Lord Krishna. Having tied the boy successfully, Yashoda returned to her chores. Meanwhile little Krishna tugged at the rope and began crawling on all fours dragging the mortar behind Him. He crawled into the courtyard and went into the space between two Arjuna trees that stood there and the mortar got stuck between them. As Krishna pulled hard, the two trees came crashing down to thunderous noise. Two demigods who were the sons of Kuvera, Nalakuvara and Manigriva emerged in effulgent heavenly forms out of the trees and humbly offered prayers to the Lord. These demigods had offended the great sage Narada who had cursed them to become trees. When they had begged forgiveness, the great sage had mitigated his curse by telling them that in the Dwapara yuga, Lord Krishna would deliver them. They had stood at that spot as trees for five thousand years and now Lord Krishna just to keep the word of His great devotee had freed them from the tree bodies. The Lord blessed them with the benediction of always being absorbed in His devotional service. The demigods gratefully circumambulated the Lord and returned to their respective heavenly abodes. Hearing the rumbling sound, the cowherd men and women in the neighbourhood came rushing to the spot and saw the two huge Arjuna trees that had fallen to the ground and little Krishna sitting tied to a wooden grinding mortar sitting in the midst. Maharaja Nanda quickly freed Krishna from the ropes and untied Him from the mortar. The inhabitants of Gokula could not fathom how the trees could have fallen. The prayer is for remembrance of the Lord and nothing else. There is no desire even for liberation in the pure devotee for the Lord’s remembrance is considered far more precious than any other blessing. The devotee expresses powerlessness in remembering the Lord and begs the Lord to bless him with that remembrance. This is the dependence of a devotee on the Lord’s mercy. It is an expression of humility and surrender. These are some of the innumerable aspects of bhakti that are celebrated for the entire month of Kartika. 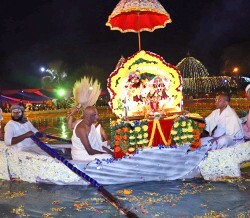 The celebrations are especially sweet in the land of Vraja where Krishna enacted these pastimes. Devotees from all over the world converge to Vrindavan during this time and many stay for the entire month and more. By the mercy of Srila Prabhupada, the Founder-Acharya of ISKCON, Damodara Deepotsava is celebrated throughout the world with great devotion. Srila Prabhupada could convey the sublime nature of Damodara lila to people all over the world and kindled within them the desire to make pure devotion to Krishna the goal of their lives. At Vrindavan Chandrodaya Mandir during the month of Kartik, the temple is decorated with lamps and colourful illuminations in the evenings. Just after sunset devotees sing the Damodarashtakam verses from Padma Purana and offer arati to the Deities of Sri Radha Vrindavanchandra with ghee lamps. There are other festivals that occur during this month. Dipavali that celebrates the return of Lord Rama to Ayodhya after 14 years of exile falls in the Kartika masa. Vishwanath Chakravarti Thakura, a renowned Vaishnava saint, states that the Damaodara lila occurred on the day of Dipavali. Another festival very popular in Vraja is Govardhana Puja, the celebration of Lord Krishna lifting Govardhana Hill. Gopashtami is celebrated as the day Lord Krishna came of age and was promoted from herding calves to herding cows. The day of appearance of Radha Kund the holiest place in the entire universe, Bahulashtami also occurs during this month. The disappearance day of Srila Prabhupada is a solemn festival falling in the month of Kartika. His followers organize meetings of remembrance and offer Abhishekam to his Deity. The entire month of Kartika is celebrated as Damodara Deepotsava and is an intense period of devotional contemplation and transcendental austerity. It is a time when devotees seek to invigorate their practice and rededicate themselves to the pure selfless principles of bhakti. It is a most inspirational, blissful time of the year!